As a non – Torontonian until just a few years ago, I have never had the pleasure of seeing the revered productions of Ross Petty. This holiday season’s savagely silly family musical of Beauty and the Beast at the Elgin Theatre has just about anything you could ask for. Familiar pop songs are woven into a humorously written script for any child or adult with the inner child still inside. Bold lighting effects and sounds, goofy characters, and dazzling dance numbers merge together for a truly enjoyable evening for parent and child alike. It is times like this I wish I had kids just to attend children’s shows… because any adult knows they are never truly child-geared, keeping in the mind all the selfless parents who must sit through it. Although I have never seen a Panto performed, I have to say it felt energizing to be part of all the raucous. The British tradition of Pantomime (Panto) is nothing like we might expect-Charlie Chaplin with white face makeup creating a fake wall. Instead, “Panto” takes popular fairy tales and children’s stories (i.e. Peter Pan, Aladdin, and Snow White) and incorporates a bit of music, contemporary themes, current cultural references, and audience participation creating a spectacle of non-stop laughs for every family member. A strong cast of charming performers also add to the fun. Former Kids in the Hall actor, Scott Thompson, brilliantly transforms himself into Bella’s Aunt Plinky. He is delightful, quick-witted, spontaneous and outrageously funny, naturally engaging the audience. I found myself anticipating every moment he/she entered the stage. Ross Petty, clearly producer extraordinaire and dually talented on the stage, wittily plays the villain character of Baron Barnum von Cowell out to destroy Prince Zack and Bella. He is clearly a veteran with the Panto genre and doesn’t flinch at any hiss or boo from the audience. Fellow Calgarian, Melissa O’Neill, a former Canadian Idol winner, beautifully plays the role of Bella with a lovely voice and presence, while her Beast, also Prince Zack, played by Jack Epstein is charmingly attractive, engaging, and sentimental. There are some great moments from the two animals turned rock stars: Buskin Beaver (Meghan Hoople) and Lady Baa Baa (Lisa Lennox) perfect for the adoring teenage fans in the audience. Prince Zack’s dynamic sidekicks Antonio (Jake Simmons) and Bert (Eddie Glen) had some comical bits as well. Steve Ross’s lighting effects were sensationally unexpected and exciting for all in the audience. Especially the final scenes in which the Beast along with the Baron challenge each other in a “ Battle of the Bands.”. With that being said, musical director Mark Camilleri greatly accompanies the whole pizzazz of the show! Erica Connor’s costume design is edgy and colourful with just the right mix of contemporary rock-star and medieval. The set design is simple and uncomplicated with just enough playfulness to seem as if a child created it herself. Lastly, the co-writers of the script, Nicholas Hune-Brown and Lorna Wright, cleverly create for us an original fairy tale spoof with just enough magic for the kids and just enough innuendos for the rest of us. Keep that holiday tradition going! If you haven’t started, now’s the time! Beauty and the Beast-The Savagely Silly Family Musical is the one to see this season. -Ticket prices range from $27-85 for adults. Children (12 and under) cost $59 or a Family of 4 Package costs $235. 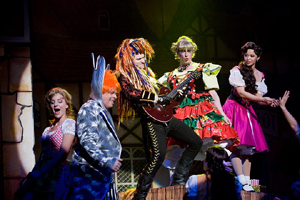 Photograph of Eddie Glen as Spork, Jake Epsteiin as Beast, Scott Thompson as Plinky and Melissa O’Neil as Bella taken by Paula Wilson.